The published information is subject to change, so we suggest you telephone to confirm. Located between the Roman Forum and the Temple of Venus. The first construction dates back to the ninth century, when it was built over an oratory built by Paul I. It was rebuilt in the thirteenth century by order of Pope Honorius II and was often altered. 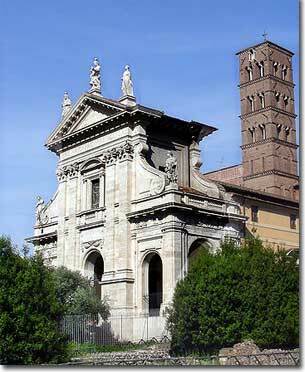 Although the original dedication of the church, was to Santa Maria Nova, in reference to another church of the Roman Forum dedicated to Santa Maria, and said Antiqua, it is more commonly known by the name of Santa Francesca Romana, assai venerata presso il popolo romano and buried in the crypt. In 1600 the church was renovated in the Baroque style by Carlo Lombardi with the entire facade of white travertine that includes at the top a balcony window and is joined to the portico that extends below. Rather, it belongs to the twelfth century Romanic bell tower up to five orders adorned with tiled inserts and crosses of porphyry and double mullioned windows. The interior is a single nave with lateral chapels and a rich coffered wooden ceiling. To be remembered the apse mosaics dating from the twelfth century depicting the Madonna and Child with Saints; the precious icon of the Madonna Glycophilusa, work of the fifth century, formerly preserved in Santa Maria Antiqua, and two interesting funerary monuments, one dedicated to Pope Gregory XI; another to Antonio da Rio, castellan of Castel Sant'Angelo in the first half of the fifteenth century, pictured here on horseback, the only example of such portraiture in the churches of Rome. In the church there is a stone slab with footprints, it is said, the knees of St. Peter and St. Paul. Giosuè Meli (Scultore) realizzò la statua di S. Francesca Romana posta sotto l'edicola. Domenico Maria Canuti (Pittore) con il "Martirio di S.Nemesio e compagni" (ai lati del transetto). con "Paolo III e il cardinal Reginald Pole"
It is the most important of the Roman triumphal arches. It was built in 313 A.D. to celebrate emperor Constantine's victory over Massenzio. It has a very ancient origin but its actual shape dates back to the last years of the V century. In it you can admire the Mosè by Michelangelo which is a work of art, unique for its incomparable expressiveness and beauty. It is a marvellous architectural complex that doesn't find examples in Roman art. Its real name is Flavian Amphitheater. It was built in 72 A.D. by an unknown architect. It can be considered a symbol of antiquity. It was the center of the civic, juridical and economic life in Republican times.